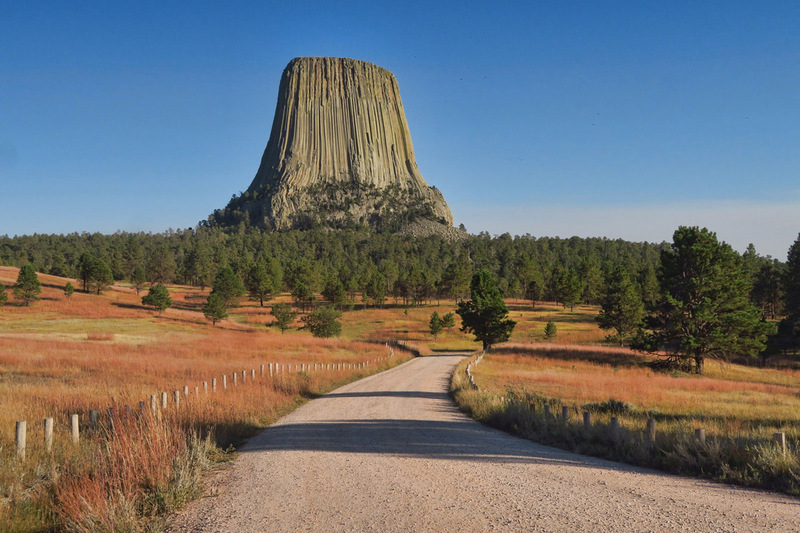 I first learned about Wyoming’s Devils Tower from Spielberg’s movie. For those either too young or may have forgotten, both scientists and Dreyfuss’ character are led to the tower by images and GPS coordinates broadcast by the aliens as their chosen landing site, thereby resulting in an encounter of the “third kind,” or face to face. The movie was such a hit it was deemed one of the best sci-fi movies of all time. 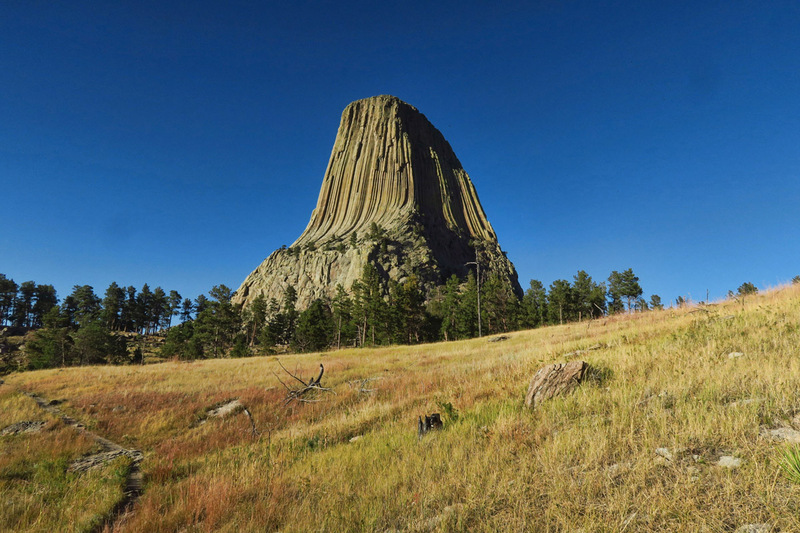 Devils Tower rises up against the sky in the rolling Black Hills of Wyoming, commanding a presence from miles away. Driving up Hwy 24, it comes into view much sooner than I anticipate. Thankfully, there are places to pull over for the scenic view, as it all but stops me dead in my tracks. From the moment I see it, the five tone musical sequence translated as a message from the aliens in the scary movie runs through my head over and over. 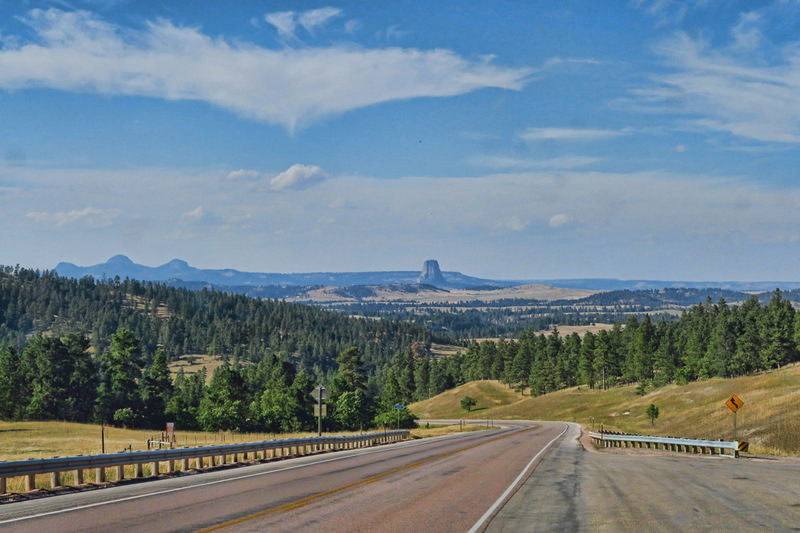 Getting my first glimpse of Devil’s Tower from Hwy 24. 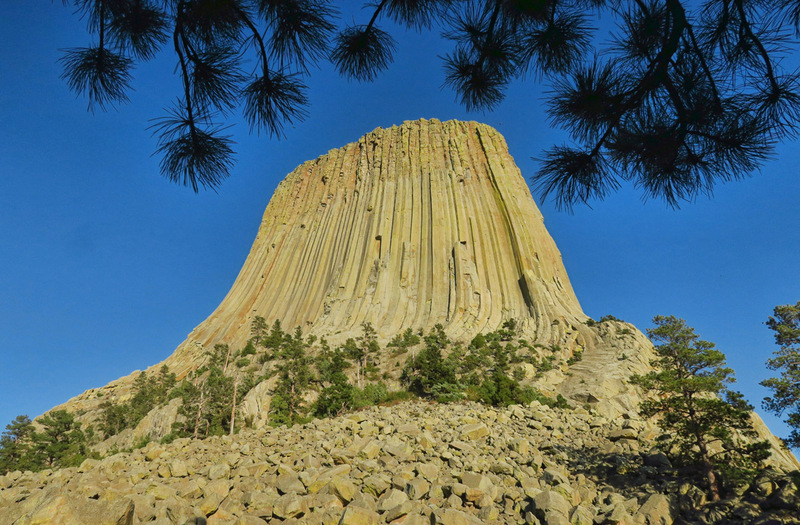 Devils Tower in Wyoming juts up from its sloping base to a height of 867 feet with a massive imposing structure that appears as tall as it is wide. 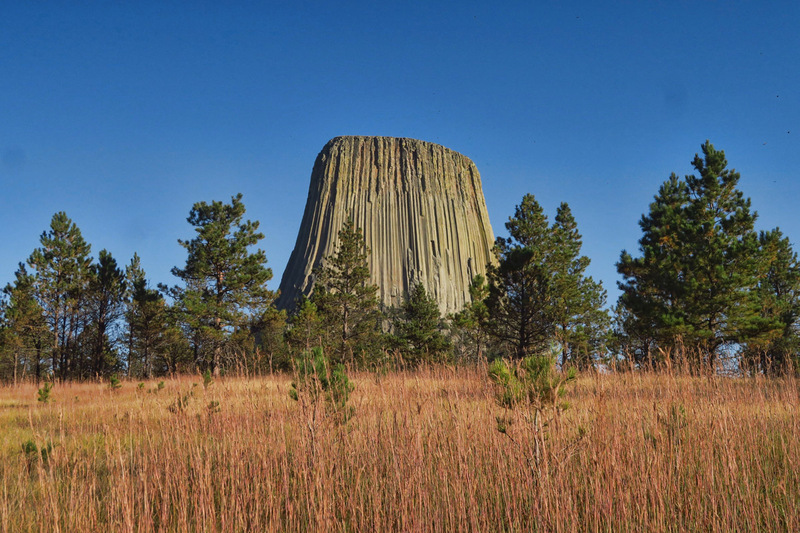 To see it in person, one truly gets a feel of just how bizarre this feature is towering up over the low rolling hills surrounding it. 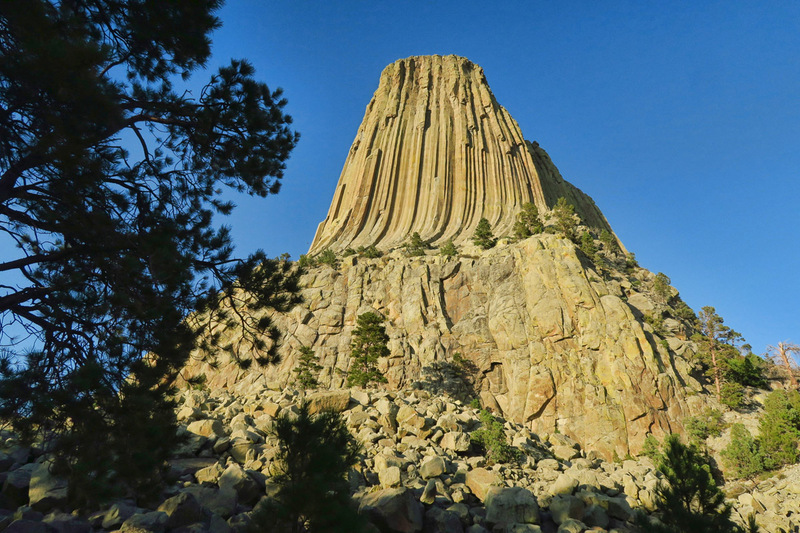 There are many theories on how Devil’s Tower was formed, from mythical to geological, with the only consensus among geologists being that it’s an “igneous intrusion,” formed underground as molten rock was forced upwards from deep within the earth. 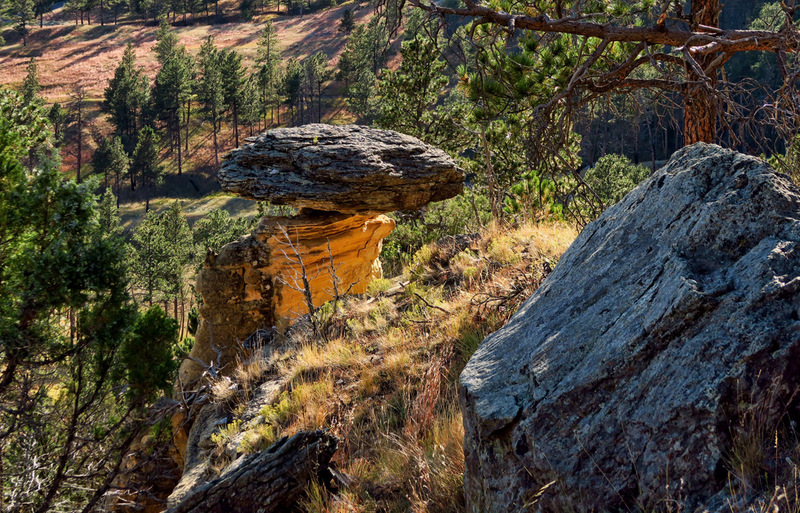 The feature emerged after millions of years of erosion of the surrounding sedentary rock. The columns appeared as a result of cracks that occurred during the cooling off of the volcanic magma. Age of the tower is estimated to be fifty million years. I am surprised at the number of pictures I took of the tower, but I can’t take my eyes off of it. The local tribes also have a legend that two young girls were playing in the plains grassland, when a bear began to approach. In fear, they cowered on a rock and began to pray to the Great Spirit for protection from the giant bear. The Great Spirit caused the rock to jut up from the surface, helping the girls escape the bear. The grooves around the structure represent the bear’s claw marks as he tried to reach the girls. 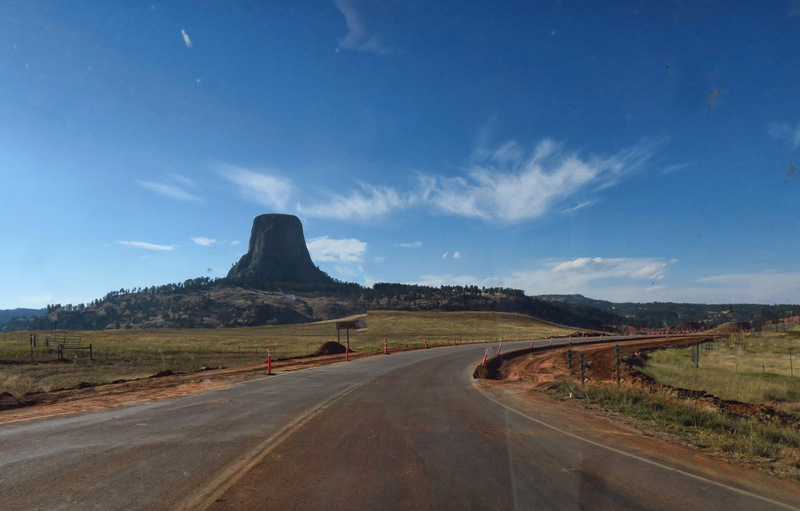 Although you will see posters and postcards in the Visitor Center Gift Shop commemorating the bear theory, in keeping with the naturalist preservation, you will see no mention of the making of the movie, Close Encounters of the Third Kind. It’s as if it didn’t happen. 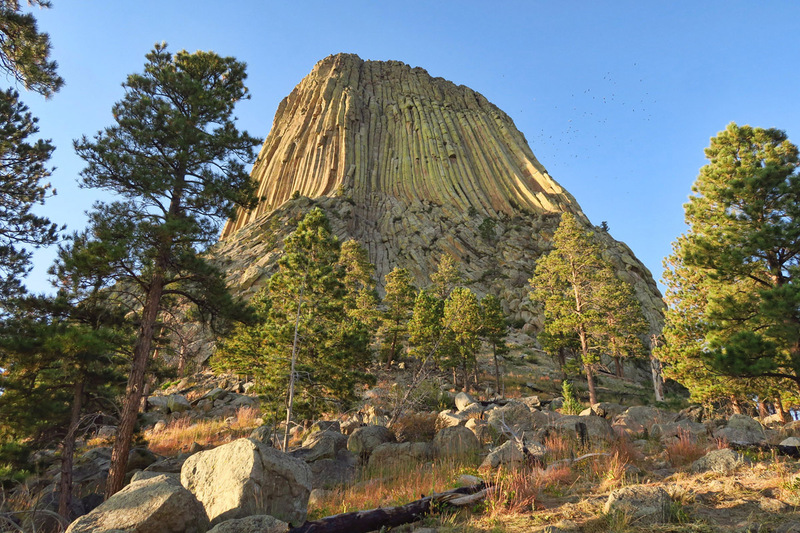 Devils Tower also has the notorious distinction of being the first National Monument established by Theodore Roosevelt in 1906 as a part of the Antiquities Act. It represents a puff of smoke from a ceremonial pipe used by Native American people. There are climbers on the mountain every day during my visit. The first summit was in 1893 by two ranchers by way of ladder made from wooden stakes driven into the cracks. That ladder was restored, and a few of the pegs remain today. An estimated 4,000 people climb the monument each year, much to the dismay of the Plains Indians tribes. They believe the monument is sacred, and should not be climbed. 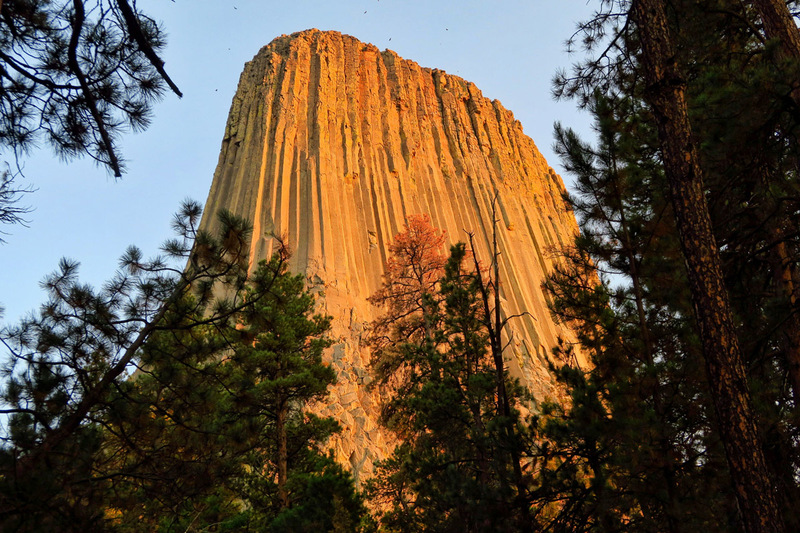 In order to honor this belief, the NPS has established a voluntary climbing ban one month out of the year in June when climbers are asked to voluntarily stay off the tower. Ironically, the most recent death from a fall happened in the month of June. The piles of rocks around the base are from columns that have fallen. No additional columns are known to have fallen in the last 200 years. 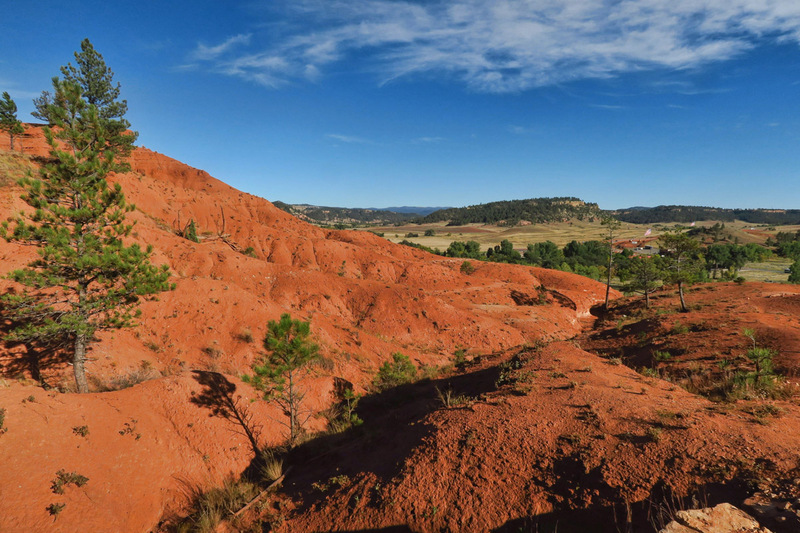 June was chosen for the voluntary climbing ban because it’s a significant spiritual time as many ceremonies take place around the summer solstice. Note climber in blue shirt in center of photo. Fastest climbing time on record was in the 80s when a WY native free-soloed (climbed alone, without ropes or protection) in 18 minutes. 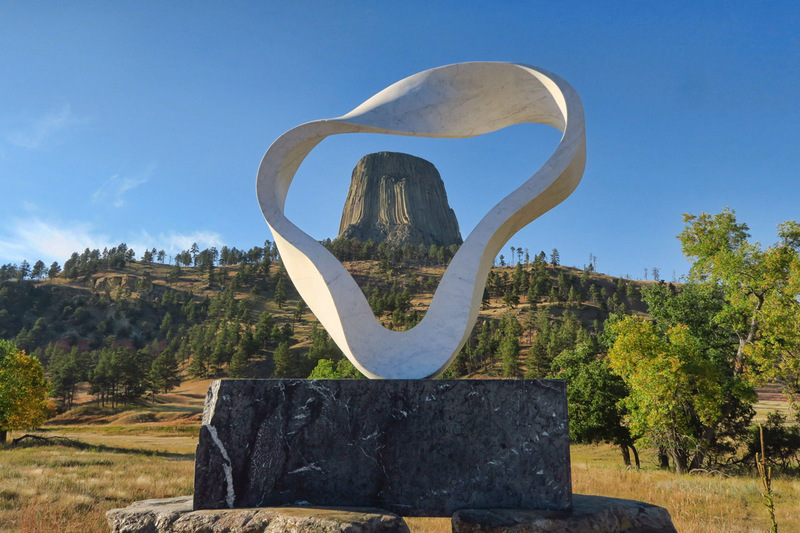 The tower shape changes as one travels around the circumference on the 1.3 mile trail. 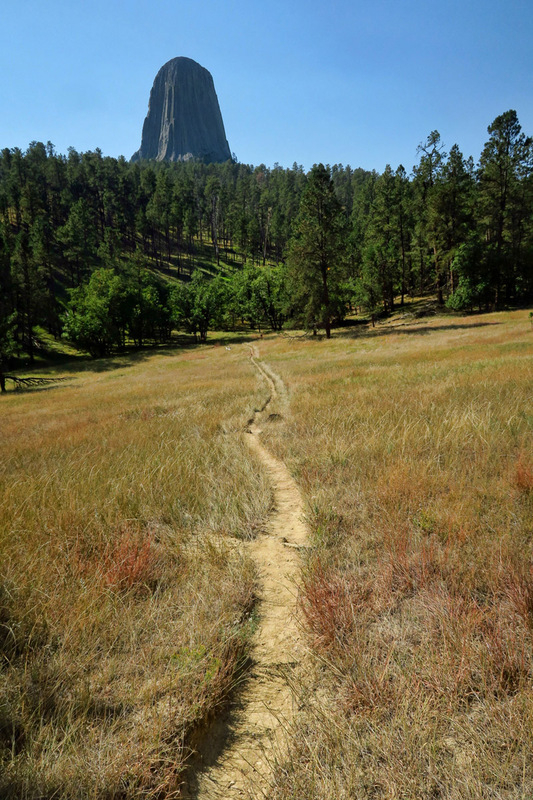 It takes an estimated 5 hours up one of the 230 climbing routes to reach the top of Devils Tower. The mostly flat, slightly sloped top is approximately one and a half acres, or the size of a football field, and it is covered in vegetation. There are also chipmunks, mice and snakes living at the top, which is pretty amazing when you ponder how they got there. The tower is composed of symmetrical columns which are the tallest (600 ft) and widest (10 to 20 ft) in the world. Most of these columns are six-sided, a result of the vertical cracks in the structure. Sunset was my favorite time to walk the trail around the base. I made this sunset “pilgrimage” all three nights I was there. Many sites in the Belle Fourche River Campground have a view of the tower as I am enjoying here from my bedroom window. 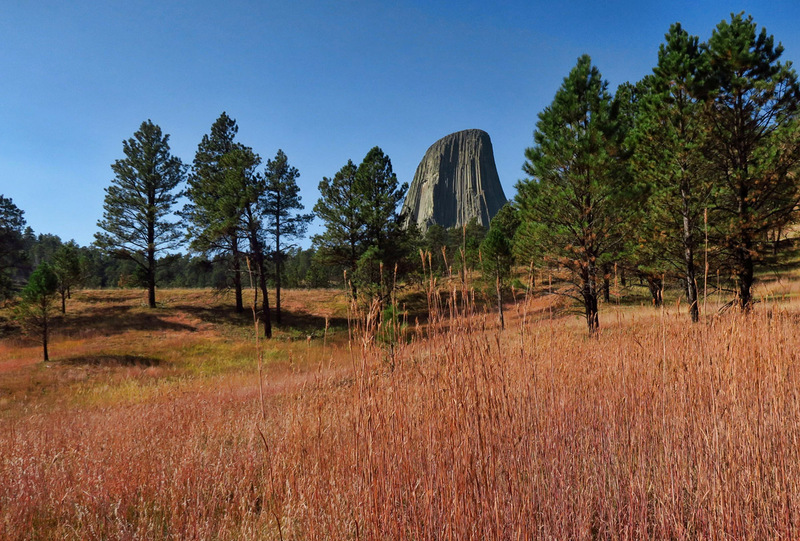 I came to Devil’s Tower with the intention of staying one night. I ended up staying three, and might have stayed longer had I not had other commitments down the road. 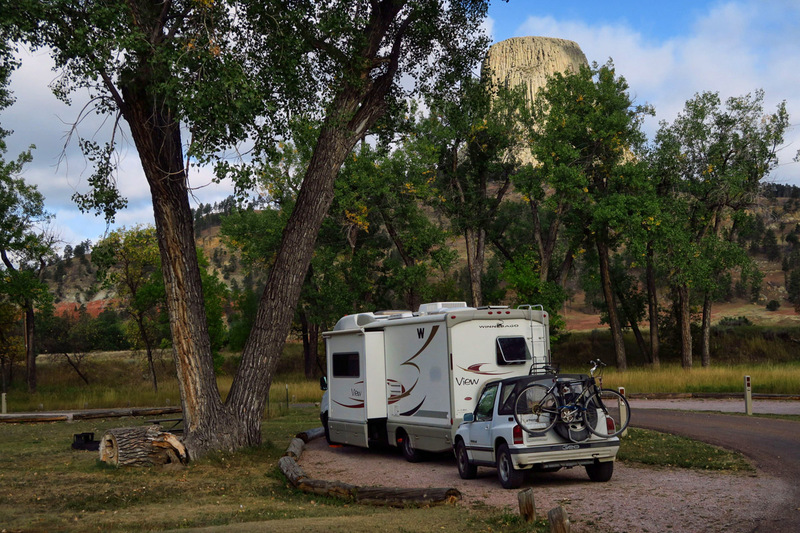 The Belle Fourche River Campground was a lovely little campground with sites well spaced apart, many with great views of the tower, and the Belle Fourche River looping around on three of the four sides. 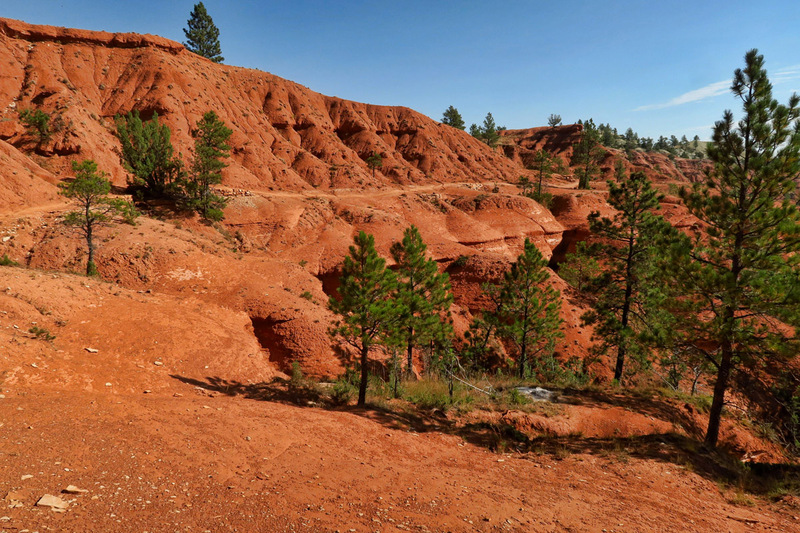 Red Beds trail is a 2.8 loop below the base of the tower. Balanced Rock along the trail leading up to the base of the tower. Red Beds trail connects to the Joyner Ridge Trail. All three trails can be linked together to make a nice 4 mile hike. This ridge hike never leaves sight of the tower. 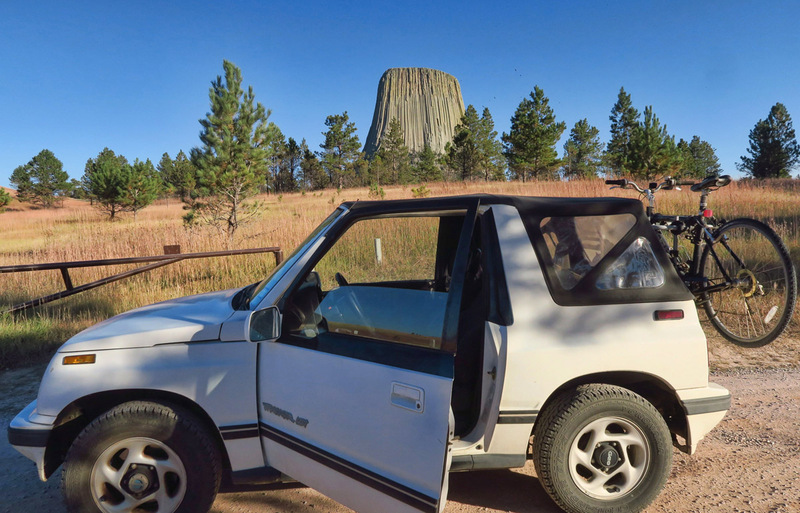 This entry was posted in Wyoming and tagged Belle Fourche River Campground, Devils Tower by Suzanne. Bookmark the permalink. Bringing back recent memories. 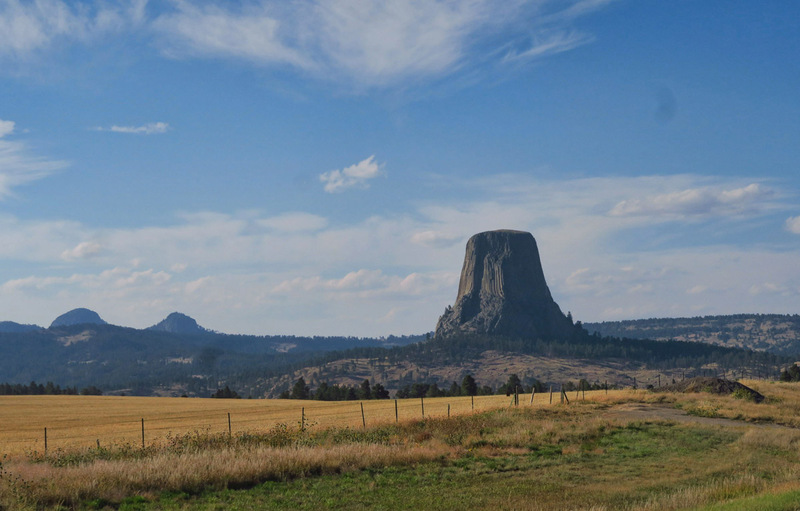 When we left Northwestern Wyoming last year, well before this year’s camphost gig, we headed east to Devils Tower and the Black Hills. 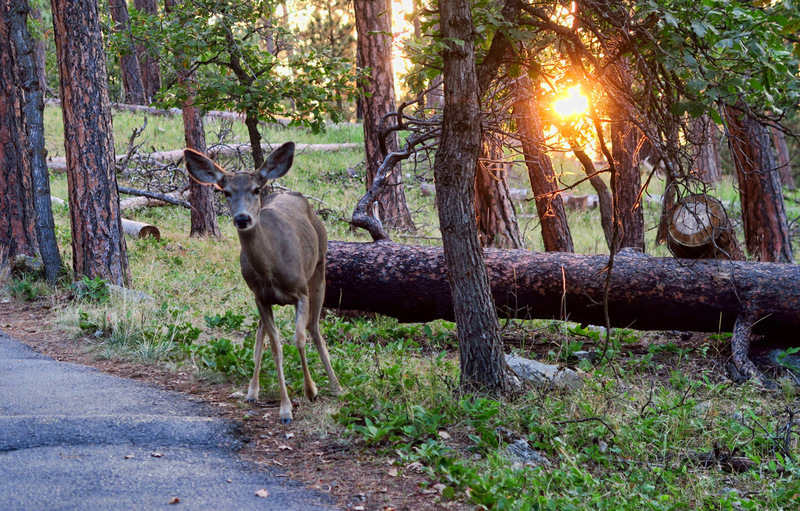 Spent about 10 days in the area, which included Deadwood, Spearfish Canyon, Sturgis, Mt. 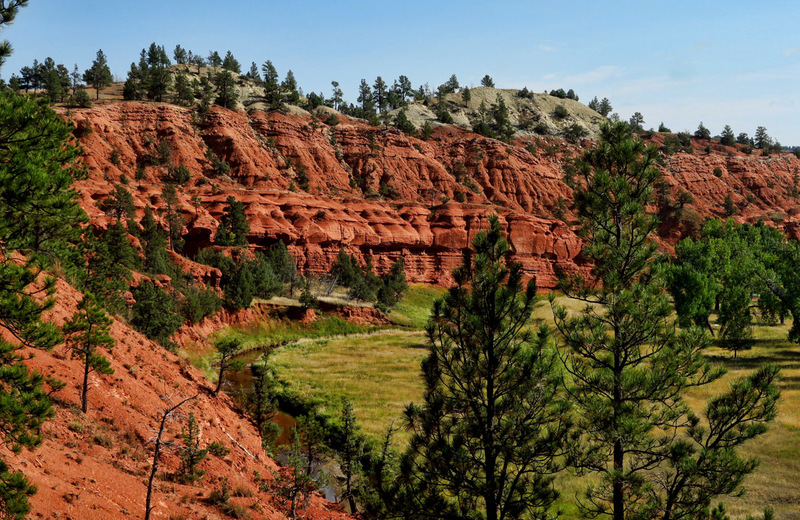 Rushmore, Crazy Horse, Custer State Park and Rapid City and Cabela’s parking lot. It was our first time, and we loved all of it. I think this is one of my all time favorite places I have visited. I too, could not stop taking photos…it is magnificent! The fact that things live on top of it is amazing. Even if a bird were to drop a live animal up there, it would need a mate…it defies explanation! Amazing photos and narrative, as always, Suzanne. Are you headed to WA now? BTW did the camera work out? I just found the user manual, if you want it. Hope to see you soon! On my bucket list. Great pictures. A terrific account Suzanne thank you. Great pictures. 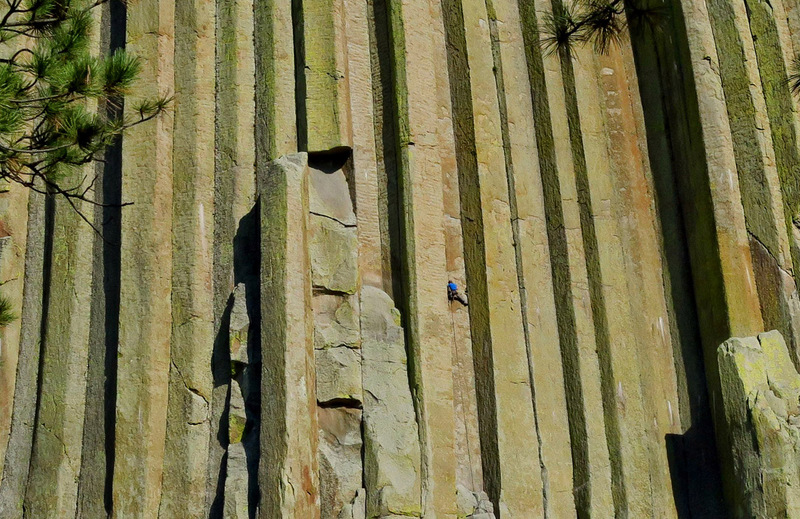 Of added interest, I had recently been shown pictures of six sided columns at Devils Postpile, California. I wonder if the aliens may have visited there also? We had every intention of making it there this year and even set dates two times but we never made it. Since it is within a couple hours of our SD place I am confident that we will make it there in ’19. 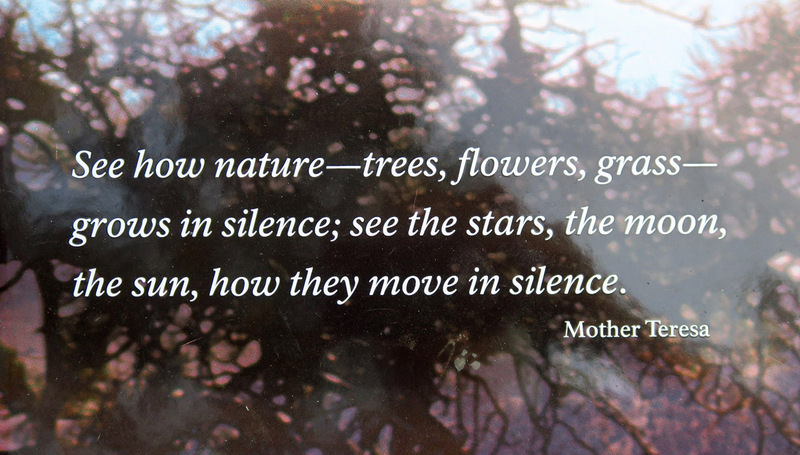 Beautiful and mystical place for sure! Its very dramatic. I can understand how geographical features like this come to have a spiritual significance. We have the Glastonbury Tor, but nowhere near as impressive as this. This post brought back some fond memories for me Suzanne. 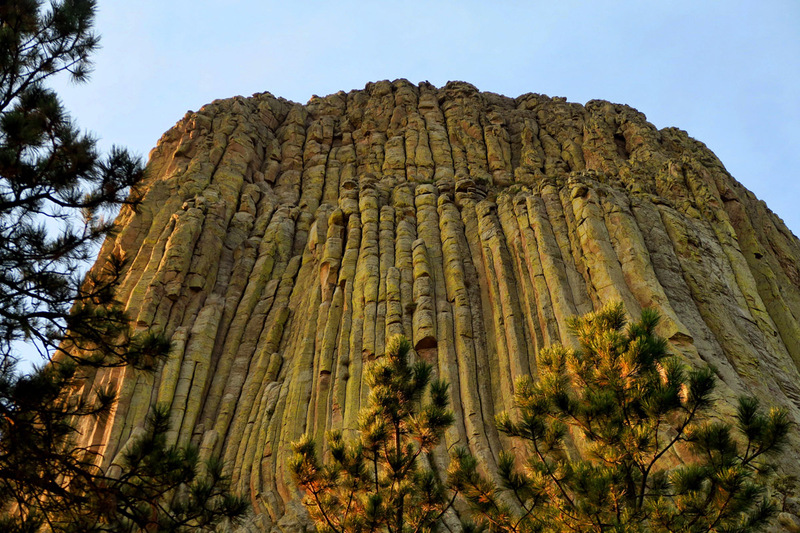 I was mesmerized by Devil’s Tower, at all times of the day and night. Your photos are lovely. Somehow this formation calls to mind the Lorelei on the Rhine River…and the definition “alluring, temptress” is befitting…beautiful photos!